This insect was first noticed here in Saskatoon in 2006. After Several cold winters the populations fell to a negligible level before they were quickly on the rise again in 2016. This insect will only affect Black and Manchurian Ash. This insect is to be taken very serious and can in fact kill your tree if left unattended. This insect hatches early in the spring (Early May) as the buds are starting to crack (sometimes before). Because of this, insect damage can have a large impact on tree health and eventual decline. After the eggs hatch, the nymphs (young) start to feed on parts of the bud and primarily on the leaf edge causing distorted leaves that curl over the young insects. As the nymphs feed on the leaf, they will continue causing damage until early to mid June when they become adults and begin to mate for the laying of the second generation eggs. These nymphs become adults by late August thereafter laying eggs in bud scales and at the base of buds for the following spring’s generation. Psyllid nymphs feed on the leaves of your tree and cause curling of the leaf edge (crumpling up of the leaves) therefore reducing the surface area for your tree to photosynthesize. This can kill a perfectly healthy tree over several years of high populations due to rapid defoliation. Early leaf drop is also noticed with heavily infected leaves. To the left is a picture to act as a guideline to determine the foliage infected by psyllid and total canopy loss. These are guidelines and are not guarantees on what level of health a tree can survive infection during treatment. Due to the huge impact this insect can cause in one year, it can sometimes be difficult to find a solution to this insect and its damage. 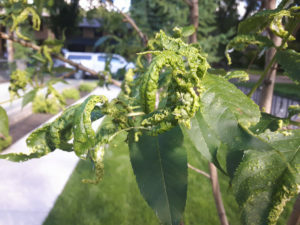 Implementing an Integrated Pest Management strategy is the only way to protect your tree from this insect. This can be sometimes too expensive for the value of the tree or due to excessive dieback. Below we have an example of IPM that can be implemented if the tree is not excessively defoliated and in poor health. Injection– Systemic insecticide injected into the base of the tree. Over the following 72 hours of treatment insecticide is translocated to the leaves where insects can ingest leaf and insecticide. One injection every two years until insect populations drop to a reasonable threshold. 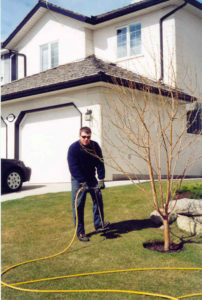 Spring insecticidal spray– Used to control primarily nymphs/eggs before leaf distortion (commonly at bud break), this can be done to further knock down populations in the beginning of the season. This can relieve high populations and will help set the tone for the season reducing stresses and increasing control of insect before primary damage is inflicted. This is strongly suggested for trees that were heavily infested the prior season or if neighbour’s trees are infected without treatments. Summer spray– Used to control adults of first generation (June). By controlling the adults of the first generation, reduction in second generation damage and infection can be obtained if done before laying eggs. This is suggested for trees severely stressed due to high populations of Psyllid on trees that are heavily infected. Late summer spray- Used to control second generation adults during mating and egg laying. This control will help relieve next year’s populations. This may also be used to gain better control of populations on off-injection years. 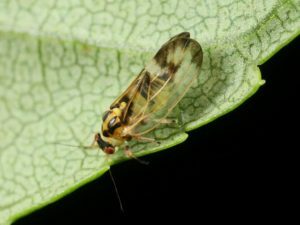 You and your neighbors- The adult Psyllid can fly and is capable from moving from one tree to another. If your neighbors have Black or Manchurian Ash please have them informed of this issue as their tree can be problematic for you. 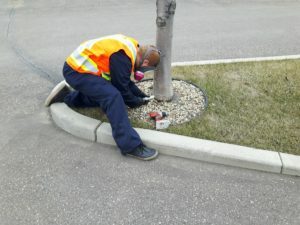 This also applies to your property if you have trees that are untreated or not quarantined. Planting- Do not plant Black or Manchurian Ash as a replacement. Green Ash is safe to plant. Self-monitored- Monitoring to establish effectiveness of treatments is important and requires some form of trap. Suggested is a yellow sticky card you can get from your local garden store or nursery. Perhaps your arborist has given you one. Noting how many adults are on this card at the end of each adult cycle will help your arborist assess effectiveness of treatments and future requirements. This can be done professionally for you. Please keep in contact with us as we can adjust treatments and longevity of treatments as required. Depending on the populations in your area, treatment length can change but this is expected in Saskatoon for the next several years. 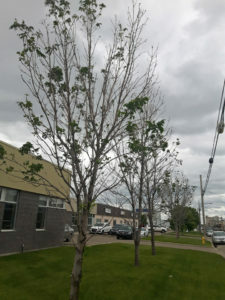 Treatment until surrounding trees are both treated and clear of psyllid or removed is a must however treatment types may change depending on severity and location as populations persist.